This is for you soup lovers out there. And bacon lovers too. 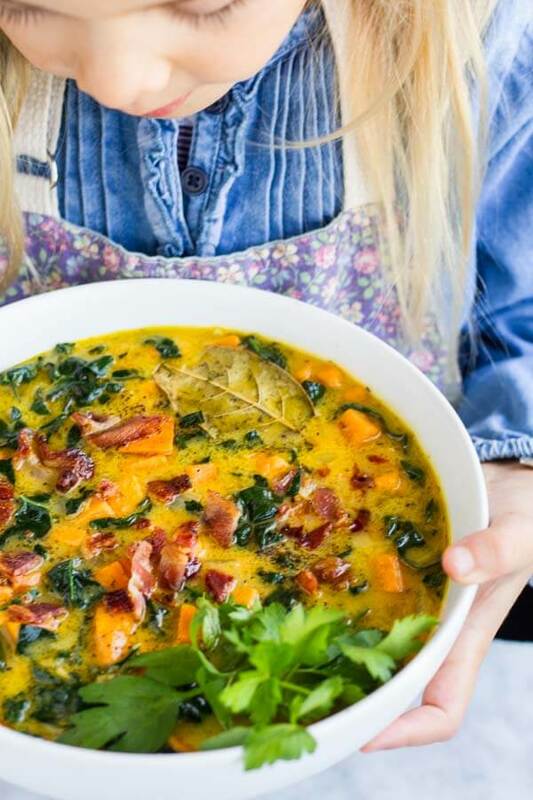 Meet my cozy Sweet Potato Bacon Chowder. Brrrr! It has been colder than usual here in Northern California. After spending 6 weeks down in Mexico on my healing journey, I was literally shocked to come home to 30 degree weather. I’ve been snuggled up next to my little wood stove enjoying the holidays with my family, recovering and resting. I plan on sharing my experience of getting intensive treatment for Lyme disease but am taking some time to process and assimilate before I put my thoughts and feelings into words. Stay tuned! But I do have soup for you today. And seeing as it’s the day after Christmas, you may be needing a warm and inviting easy meal to share with your family. I think I’ve mentioned it before that kale and bacon are two of my favorite foods. So here they are combined into an easy to make winter chowder. Think creamy, flavorful, hearty, and comforting. 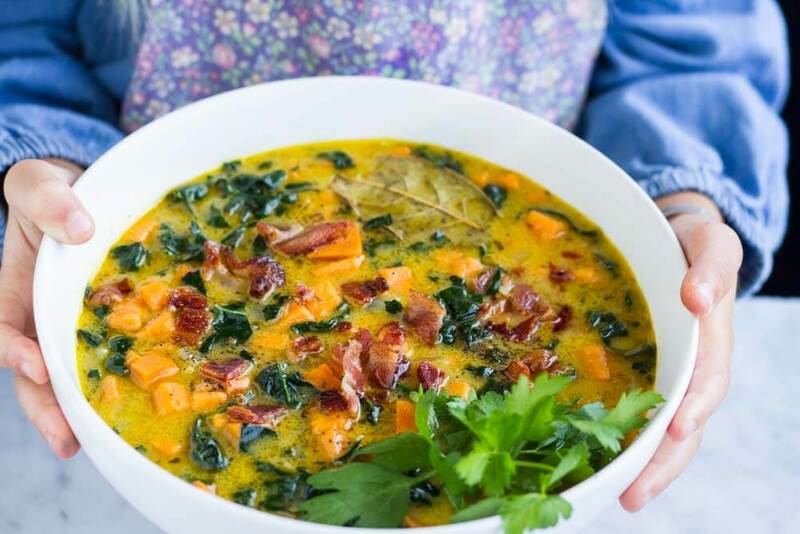 Loaded with nutrient dense broth, sweet potatoes, and kale, this chowder will make both your heart and belly happy. Wishing you all infinite abundance and good health for the coming year. 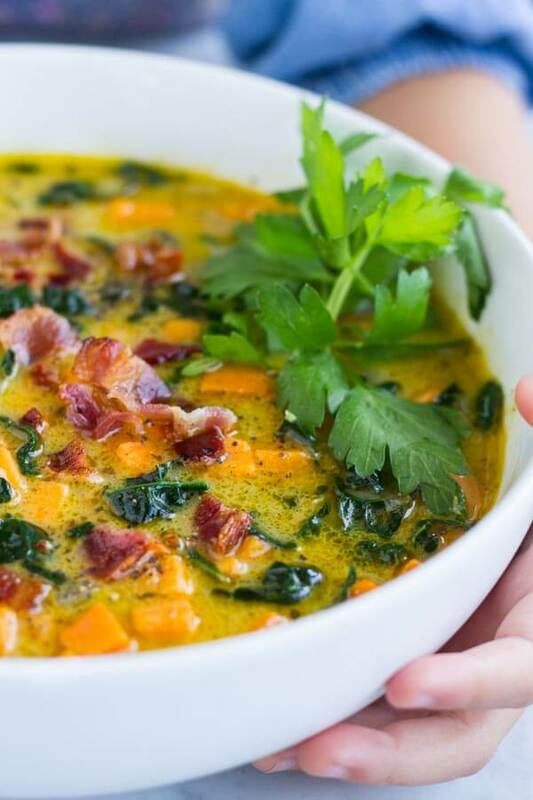 Hope you enjoy this sweet potato bacon chowder as much as we did! Cook bacon in a large skillet until well done and crispy. Set aside. Meanwhile, melt 2 tablespoons of fat of choice (butter/ghee/coconut oil) in a large pot. Add onions and cook until translucent and beginning to brown. Add garlic and cook another 30 seconds. Add broth, sweet potato, bay leaf, thyme, and dill. Bring to a boil, reduce heat and simmer (covered) until potatoes are tender, about 12-15 minutes. Stir in sliced kale and cook until wilted and bright green. Add in coconut milk and season with salt and pepper. Serve immediately, garnished with chopped crispy bacon and parsley. 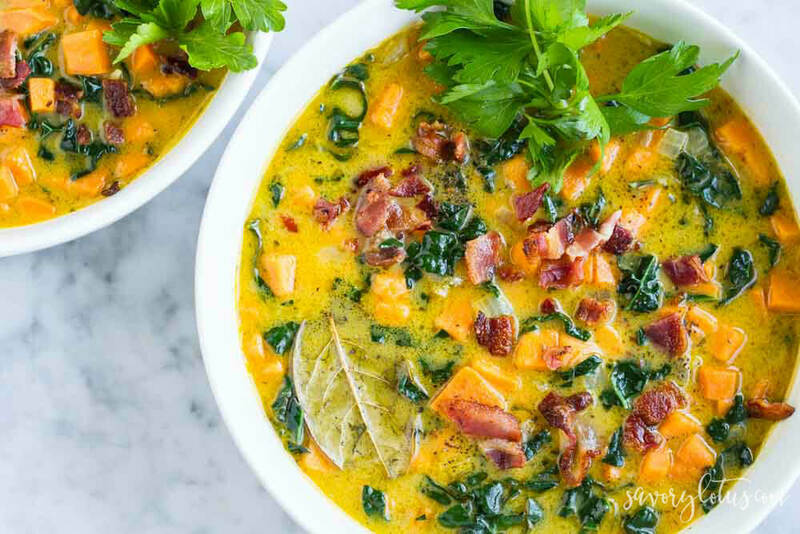 This chowder looks absolutely delicious! Now if I can get my husband to eat sweet potatoes. It was DELICIOUS! I’m putting it in our regular house soup rotation. This soup was delicious. Thank you for the recipe. I’m a making a different soup every week and I was running out of ideas. This is a keeper. 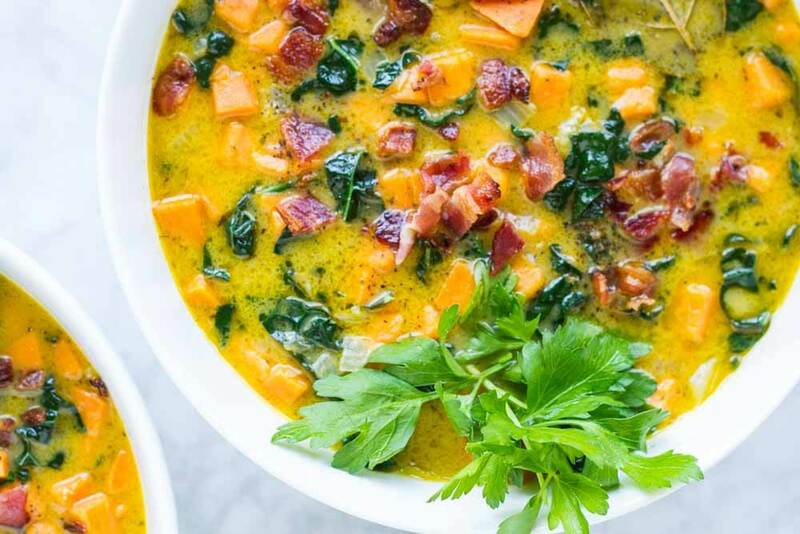 I will be trying your butternut soup next week! Yay! I am so glad you liked it. It’s a favorite around here a s well. Thanks for taking the time to leave your feedback! Do you think this would freeze well? I try to double batch all of my soups so I can freeze a few portions for workdays when I haven’t planned my meals in advance and don’t have time to cook. It sounds delicious! Yes, I think it will freeze just fine. I do the same thing. I love having extra meals in freezer for busy days. I just started back at work and love the idea of having freezer meals for those busy days. Curious how do you freeze for travel? I would LOVE to try this! Thanks! Oh my word! I’m moving things around on my dinner menu this week to make room for this! Thank you! Hope you guys love it, Renee! Yes please!!! This chowder is so beautiful!!! I wish I had a big bowl of this for breakfast today with lots of that beautiful bacon. YUM! I love the color of this soup! 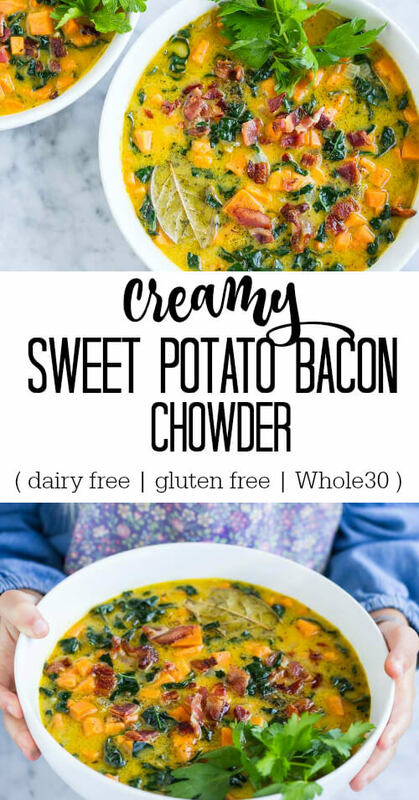 Bacon and sweet potato are my favorite combo, so I’ll need to try this. 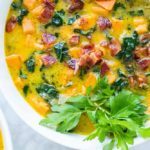 Sweet potatoes and bacon are sort of like PB and J to me! I’m traveling back east this week and this recipe will be such a hit with the family! Thank you! Hope they love it! Safe travels. This looks so comforting and delicious! I could go for big bowl right now! This loves absolutely sinful and comforting and just YUM! Summer left s suddenly this year, |I am craving hearty soups like this one! Me, too! I love soup season! Katja ! this chowder looks so creamy and delicious. I love that it has sweet potatoes and bacon. Lovely healthy protein. Yum !! This looks superb! What would you suggest as a bacon substitute? I’m starting to become more and more of a soup fan of late! You could just leave the bacon out of you do not do meat. You could add any b=vegetable that you like instead. This is a game changer!!! I cannot get enough of this new this soup!!! Yummy! We love this recipe. In fact we added clams and mushrooms. Thanks for posting this recipe. Many continued blessings. Clams and mushrooms sounds amazing! YUM! Love this recipe so much!! I I tried it first with the coconut milk, which was a little too much coconut flavor for me. I made it again with cashew milk and loved it! This has now become a go to staple recipe in our house! Thank you! I am so glad that you enjoyed it. I love cashew milk too. Katja- planning to make this soup tonight. Do you mash up or blend the sweet potatoes at all before addingthe Kale? Or they just soften on their own? Delicious! It had my 6 year old proclaiming “I love kale!” Whoa. Must double the batch next time. I did double the herbs and used a whole can of full fat coconut milk instead of just a cup. Yum!! YAY! That’s awesome. I love hearing that. If using fresh herbs, how much should I put of each? And when do I throw these in the pot? Quick, easy and delicious! Thank you for sharing! !